Mound Cemetery, Hunt City Township, Jasper County, Illinois, U.S. He began as an itinerant singer and banjoist, and launched his own radio show, The Wayfaring Stranger, which popularized traditional folk songs. In 1942, he appeared in Irving Berlin's This Is the Army, and then became a major star of CBS radio. In the 1960s, he successfully crossed over into country music, recording hits such as "A Little Bitty Tear" and "Funny Way of Laughing". A popular film actor through the late 1940s and 1950s, Ives's best-known roles in that medium included parts in So Dear to My Heart and Cat on a Hot Tin Roof, as well as Rufus Hannassey in The Big Country, for which he won an Academy Award for Best Supporting Actor. Ives was born near Hunt City, an unincorporated town in Jasper County, Illinois, near Newton, Illinois, to Levi "Frank" Ives (1880–1947) and Cordelia "Dellie" (née White) (1882–1954). He had six siblings: Audry, Artie, Clarence, Argola, Lillburn, and Norma. His father was first a farmer and then a contractor for the county and others. One day, Ives was singing in the garden with his mother, and his uncle overheard them. He invited his nephew to sing at the old soldiers' reunion in Hunt City. The boy performed a rendition of the folk ballad "Barbara Allen" and impressed both his uncle and the audience. From 1927 to 1929, Ives attended Eastern Illinois State Teachers College (now Eastern Illinois University) in Charleston, Illinois, where he played football. During his junior year, he was sitting in English class, listening to a lecture on Beowulf, when he suddenly realized he was wasting his time. As he walked out of the door, the professor made a snide remark, and Ives slammed the door behind him , shattering the window in the door . Sixty years later, the school named a building after its most famous dropout. Ives was also involved in Freemasonry from 1927 onward. On July 23, 1929, in Richmond, Indiana, Ives made a trial recording of "Behind the Clouds" for the Starr Piano Company's Gennett label, but the recording was rejected and destroyed a few weeks later. In later years, Ives did not recall having made the record. Ives traveled about the U.S. as an itinerant singer during the early 1930s, earning his way by doing odd jobs and playing his banjo. He was jailed in Mona, Utah, for vagrancy and for singing "Foggy Dew", which the authorities decided was a bawdy song. Around 1931, he began performing on WBOW radio in Terre Haute, Indiana. He also went back to school, attending classes at Indiana State Teachers College (now Indiana State University). During the late 1930s, Ives also attended the Juilliard School in New York. In 1940, Ives began his own radio show, titled The Wayfaring Stranger after one of his ballads. Over the next decade, he popularized several traditional folk songs, such as "Foggy Dew" (an Irish folk song), "The Blue Tail Fly" (an old minstrel tune now better known as "Jimmy Crack Corn"), and "Big Rock Candy Mountain" (an old hobo song). He was also associated with the Almanac Singers (Almanacs), a folk-singing group which at different times included Woody Guthrie, Will Geer, Millard Lampell, and Pete Seeger. The Almanacs were active in the American Peace Mobilization (APM), an antiwar group opposed to American entry into World War II and Franklin Roosevelt's pro-Allied policies. They recorded such songs as "Get Out and Stay Out of War" and "Franklin, Oh Franklin". In June 1941, promptly after the Nazi invasion of the Soviet Union, the APM reorganized itself into the prowar American People's Mobilization. Ives and the Almanacs rerecorded several of their songs to reflect the group's new stance in favor of US entry into the war. Among them were "Dear Mr. President" and "Reuben James" (the name of a US destroyer sunk by the Germans before US entry into the war). In early 1942, Ives was drafted into the U.S. Army. He spent time first at Camp Dix, then at Camp Upton, where he joined the cast of Irving Berlin's This Is the Army. He attained the rank of corporal. When the show went to Hollywood, he was transferred to the Army Air Force. He was discharged honorably, apparently for medical reasons, in September 1943. Between September and December 1943, Ives lived in California with actor Harry Morgan (who would later go on to play Officer Bill Gannon in the 1960s version of Jack Webb's TV show Dragnet, and Colonel Sherman T. Potter on M*A*S*H). In December 1943, Ives went to New York to work for CBS radio for $100 a week. In 1944, he recorded The Lonesome Train, a ballad about the life and death of Abraham Lincoln, written by Earl Robinson (music) and Lampell (lyrics). On December 6, 1945, Ives married 29-year-old script writer Helen Peck Ehrlich. Their son Alexander was born in 1949. In 1947, Ives recorded one of many versions of "The Blue Tail Fly", but paired this time with the popular Andrews Sisters (Patty, Maxene, and LaVerne). The flip side of the record was a fast-paced "I'm Goin' Down the Road". Ives hoped the trio's success would help the record sell well, and indeed it did, becoming both a best-selling disc and a Billboard hit. His version of the 17th-century English song "Lavender Blue" became his first hit and was nominated for an Academy Award for Best Original Song for its use in the 1949 film So Dear to My Heart. Music critic John Rockwell said, "Ives' voice ... had the sheen and finesse of opera without its latter-day Puccinian vulgarities and without the pretensions of operatic ritual. It was genteel in expressive impact without being genteel in social conformity. And it moved people." Ives was identified in the 1950 pamphlet Red Channels and blacklisted as an entertainer with supposed Communist ties. In 1952, he cooperated with the House Un-American Activities Committee (HUAC) and agreed to testify. Ives' statement to the HUAC ended his blacklisting, allowing him to continue acting in movies, but it also led to a bitter rift between Ives and many folk singers, including Pete Seeger, who accused Ives of naming names and betraying the cause of cultural and political freedom to save his own career. Forty-one years later, Ives, by then confined to a wheelchair, reunited with Seeger during a benefit concert in New York City. They sang "Blue Tail Fly" together. Others who were not able to continue working after Ives' testimony put them on the blacklist for more than a decade were far less forgiving. Ives expanded his appearances in films during this decade. His movie credits include the role of Sam the Sheriff of Salinas, California, in East of Eden, Big Daddy in Cat on a Hot Tin Roof, roles in Desire Under the Elms, Wind Across the Everglades, The Big Country, for which he won an Academy Award for Best Supporting Actor, Ensign Pulver, the sequel to Mister Roberts, and Our Man in Havana, based on the Graham Greene novel. In the 1960s, Ives began singing country music with greater frequency. In 1962, he released three songs that were popular with both country music and popular music fans: "A Little Bitty Tear", "Call Me Mister In-Between", and "Funny Way of Laughing." Ives had several film and television roles during the 1960s and 1970s. In 1962, he starred with Rock Hudson in The Spiral Road, which was based on a novel of the same name by Jan de Hartog. He also starred in Disney's Summer Magic with Hayley Mills, Dorothy McGuire, and Eddie Hodges, and a score by Robert and Richard Sherman. In 1964, he played the genie in the movie The Brass Bottle with Tony Randall and Barbara Eden. Ives' "A Holly Jolly Christmas" and "Silver and Gold" became Christmas standards after they were first featured in the 1964 CBS-TV presentation of the Rankin/Bass stop-motion animated family special Rudolph the Red-Nosed Reindeer. Johnny Marks had composed the title song (originally an enormous hit for singing cowboy Gene Autry) in 1949, and producers Rankin and Bass retained him to compose the TV special's soundtrack. Ives voiced Sam the Snowman, the banjo-playing "host" and narrator of the story, explaining how Rudolph used his "nonconformity", as Sam refers to it, to save Christmas from being cancelled due to an impassable blizzard. The following year, Ives rerecorded all three of the Johnny Marks hits which he had sung in the TV special, but with a more "pop" feel. He released them all as singles for the 1965 holiday season, capitalizing on their previous success. Ives performed in other television productions, including Pinocchio and Roots. He starred in two television series: O.K. Crackerby! (1965–66), which costarred Hal Buckley, Joel Davison, and Brooke Adams, and The Bold Ones: The Lawyers (1969–72). O.K. Crackerby!, which was about the presumed richest man in the world, replaced Walter Brennan's somewhat similar The Tycoon on the ABC schedule from the preceding year. Ives occasionally starred in macabre-themed productions. In 1970, for example, he played the title role in The Man Who Wanted to Live Forever, in which his character attempts to harvest human organs from unwilling donors. In 1972, he appeared as old man Doubleday in the episode "The Other Way Out" of Rod Serling's Night Gallery, in which his character seeks a gruesome revenge for the murder of his granddaughter. Ives and Helen Peck Ehrlich were divorced in February 1971. Ives then married Dorothy Koster Paul in London two months later. In their later years, Ives and Dorothy lived in a waterfront home in Anacortes, Washington, in the Puget Sound area, and in Galisteo, New Mexico, on the Turquoise Trail. In the 1960s, he had another home just south of Hope Town on Elbow Cay, a barrier island of the Abacos in the Bahamas. In honor of Ives' influence on American vocal music, on October 25, 1975, he was awarded the University of Pennsylvania Glee Club Award of Merit. This award, initiated in 1964, was "established to bring a declaration of appreciation to an individual each year who has made a significant contribution to the world of music and helped to create a climate in which our talents may find valid expression." When America Sings opened in 1974, Ives voiced the main host, Sam Eagle, an Audio-Animatronic. Ives lent his name and image to the U.S. Bureau of Land Management's "This Land Is Your Land – Keep It Clean" campaign in the 1970s. He was portrayed with the program's fictional spokesman, Johnny Horizon. Ives was a pipe smoker. (The cover of his first album showed a pipe and a fishing hat with the words "Burl Ives" in between.) He also smoked cigars. In the summer of 1994, he was diagnosed with oral cancer. After several unsuccessful operations, he decided against further surgery. He fell into a coma and died from the disease on April 14, 1995, at the age of 85, at his home in Anacortes, Washington. He was buried in Mound Cemetery in Hunt City Township, Jasper County, Illinois. Ives' Broadway career included appearances in The Boys From Syracuse (1938–39), Heavenly Express (1940), This Is the Army (1942), Sing Out, Sweet Land (1944), Paint Your Wagon (1951–52), and Dr. Cook's Garden (1967). His most notable Broadway performance (later reprised in a 1958 movie) was as "Big Daddy" Pollitt in Cat on a Hot Tin Roof (1955–56). Ives had a long-standing relationship with the Boy Scouts of America. He was a Lone Scout before that group merged with the Boy Scouts of America in 1924. The organization "inducted" Ives in 1966. He received the Boy Scouts' Silver Buffalo Award, its highest honor. The certificate for the award is on display at the Scouting Museum in Valley Forge, Pennsylvania. Ives often performed at the quadrennial Boy Scouts of America jamboree, including the 1981 jamboree at Fort A.P. Hill in Virginia, where he shared the stage with the Oak Ridge Boys. There is a 1977 sound recording of Ives being interviewed by Boy Scouts at the National Jamboree at Moraine State Park, Pennsylvania. Ives was also the narrator of a 28-minute film about the 1977 National Jamboree. In the film, which was produced by the Boy Scouts of America, Ives "shows the many ways in which Scouting provides opportunities for young people to develop character and expand their horizons." 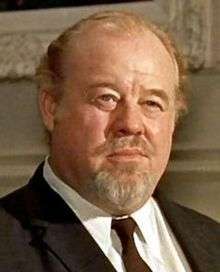 Burl Ives was inducted as a laureate of the Lincoln Academy of Illinois and awarded the Order of Lincoln (the state’s highest honor) by the governor of Illinois in 1976 in the area of the performing arts. Reuben F. Scarf's house, Sydney, Australia, GROW Party, 1977. Angels We Have Heard: The Christmas Song Stories, written by James Adam Richliano. Chatham, New York: Star Of Bethlehem Books, 2002. (Includes a chapter on Ives' involvement in the making of "A Holly Jolly Christmas", along with an interview with his wife, Dorothy Ives. ↑ Burl Ives (1948). Wayfaring Stranger. New York: Whittlesey House, pp. 15–20. ↑ Betsy Cole, "Eastern Mourns Burl Ives", Daily Eastern News, April 17, 1995. ↑ Ives, Wayfaring Stranger pp. 108–109. ↑ Associated Press, "Eastern Illinois University Honors Famed Dropout Burl Ives," St. Louis Post Dispatch, May 3, 1990, p. 71. Accessed via NewsBank. ↑ Burl Ives Museum, Ancient and Accepted Scottish Rite. ↑ Tony Russell, Country Music Records: A Discography, 1921–1942, Oxford: Oxford University Press, 2004, pp. 17, 369. ↑ Wayfaring Stranger pp. 129–132. ↑ Wayfaring Stranger p. 145. ↑ "Testimony of Burl Icle Ives, New York, N.Y. [on May 20, 1952]," Hearings before the Subcommittee to Investigate the Administration of the Internal Security Act and Other Internal Security Laws of the Committee on the Judiciary, United States Senate, Eighty-Second Congress, Second Session on Subversive Infiltration of Radio, Television, and the Entertainment Industry. Washington, D.C.: GPO, 1952. Part 2, p. 206. ↑ "Burl Ives Weds Script Writer," New York Times, December 8, 1945, p. 24. Accessed via ProQuest Historical Newspapers. ↑ Burl Ives Biography, Sitcoms Online. ↑ John Rockwell, quoted in book review of Outsider, John Rockwell on the Arts, 1967–2006, by John Rockwell, the New York Times Book Review, December 24, 2006, p. 13. ↑ Dean Kahn, "Ives-Seeger Rift Finally Ended with 'Blue-Tail Fly' Harmony: Skagitonians Ives, Murros Were on Opposite Sides," Knight Ridder Tribune Business News [from Bellingham Herald, Washington], March 19, 2006, p. 1. Accessed via ProQuest ABI/Inform. ↑ "Wayfaring Stranger Burl Ives Performs at the Book and Author Luncheon". WNYC. 1954. Retrieved November 3, 2016. ↑ Lone Scout Foundation, "How the Lone Scouts of America Came To Be": link. ↑ Guide to the Burl Ives Papers, 1913–1975, New York Public Library for the Performing Arts: link. ↑ NNDB: Tracking the Entire World: Silver Buffalo: link. ↑ The World of Scouting Museum at Valley Forge: Our Collection: link. ↑ John C. Halter, "A Spirit of Time and Place," Scouting Magazine, September 2004: link. ↑ WorldCat: OCLC No. 28143341: link. ↑ WorldCat: OCLC No. 5641115: link. ↑ "Laureates by Year - The Lincoln Academy of Illinois". The Lincoln Academy of Illinois. Retrieved March 4, 2016. ↑ Keogh, C.B. (1979). GROW Comes of Age: A Celebration and a Vision!. Sydney, Australia: GROW Publications. ISBN 0-909114-01-3. OCLC 27588634. ↑ "Archived copy". Archived from the original on September 29, 2007. Retrieved March 13, 2007. Wikimedia Commons has media related to Burl Ives. Burl Ives addressing the The New York Herald Tribune Book and Author Luncheon, February 10, 1954, broadcast by WNYC.